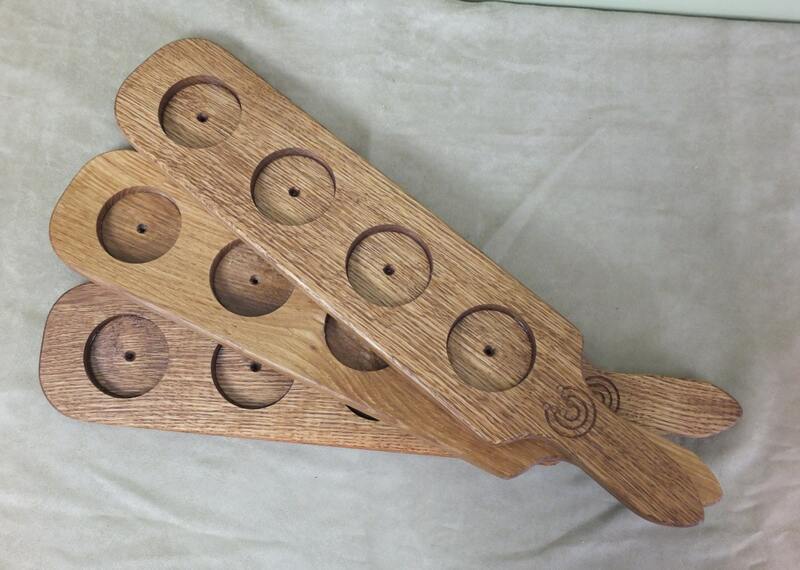 Order your beer flight paddles/wine flight paddles from Midland Moose Works! The paddle shown here is white oak and holds 4 glasses for your tasting pleasure! It is shown with a custom logo on front and back. This paddle can be custom engraved with text or a logo. Put your best man's name on the handle, or that of your groomsmen! Two lines of text or a very simple logo can be added for $5.00. We reserve the right to determine if a logo is too complex to be included in this $5.00 add on. We can add any logo, but will charge a one time set up fee, depending on the complexity. This paddle has feet on the back--you may order without feet. Our boards are finished by hand then given several coats of tung oil. Item Size: 4" x 20" x 3/4"
Orders of more than 10 will be priced at $20.00 each (without engraving); orders of more than 30 will be priced at $15.00 each (without engraving). Contact us for shipping costs for large orders. We make our serving boards in Midland, Michigan, using only North American hardwoods.